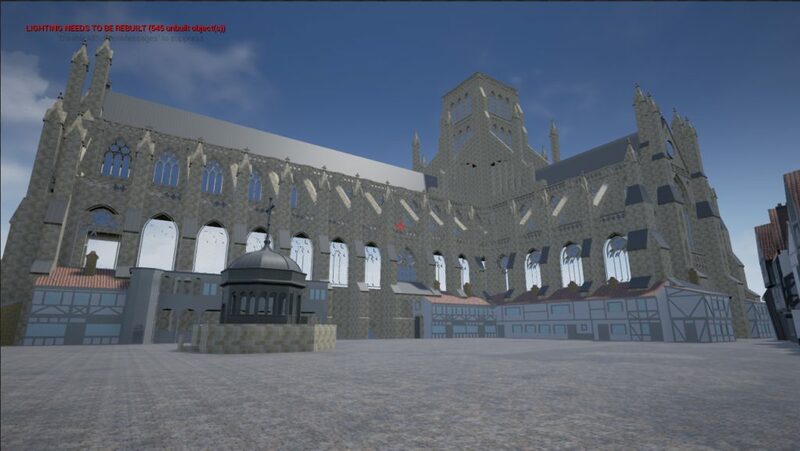 The Virtual St Paul’s Cathedral Project is developing a version of our model of the Cathedral and the Churchyard viewable in a 3D Virtual Reality environment. This will make possible for the user to explore the entire model and experience the space and events modeled within the space using a 3D headset, as though the user were actually in the space during the time of the events being modeled. This process involves transfer of the model into the Unreal Engine game environment developed by Epic Games of Cary, NC. 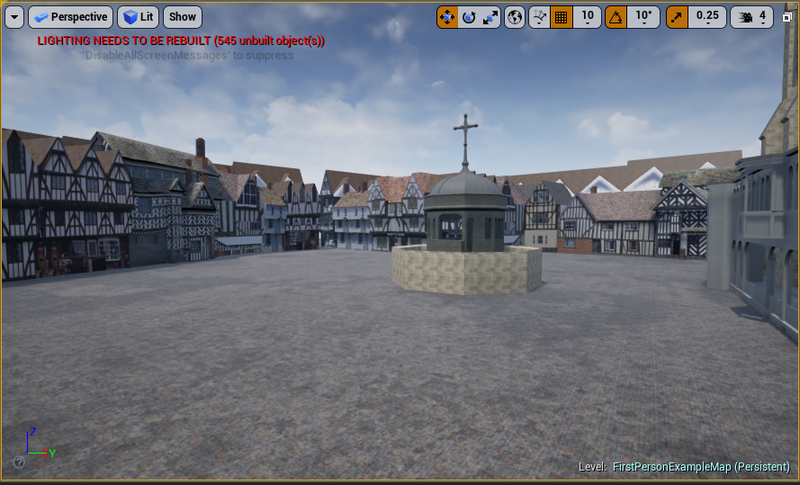 We will then develop processes for rendering the model in real time, that is, adding the effects of time, weather, and light to the viewer’s experience. 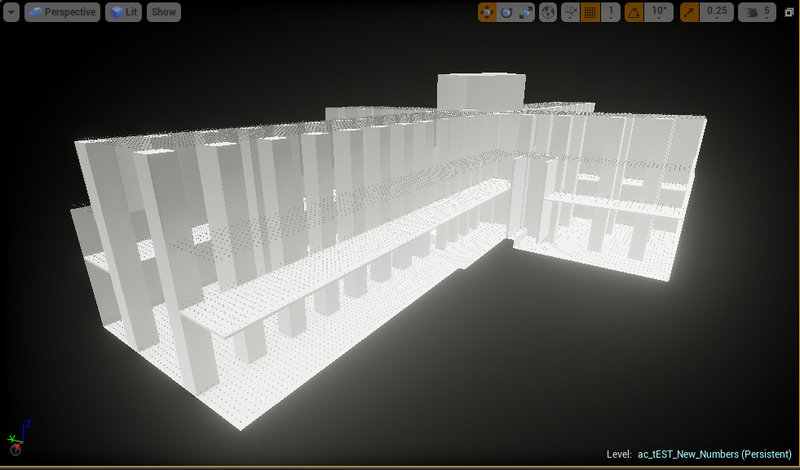 The images shown here are screen shots of the model in the Unreal Engine. The game engine was set up in a first person configuration with basic assets included. A first person actor was placed in the game world to allow for basic observation. The building meshes and materials were imported directly from the Sketchup model without any modification or optimization. Errors seen in the building meshes are in areas along the windows of the cathedral that are not visible from the courtyard. These correspond to the reversed faces shown in the images titled Model Analysis 1 and 2. Steps were not taken to correct these issues at this time but it is possible to correct this within the modeling software. 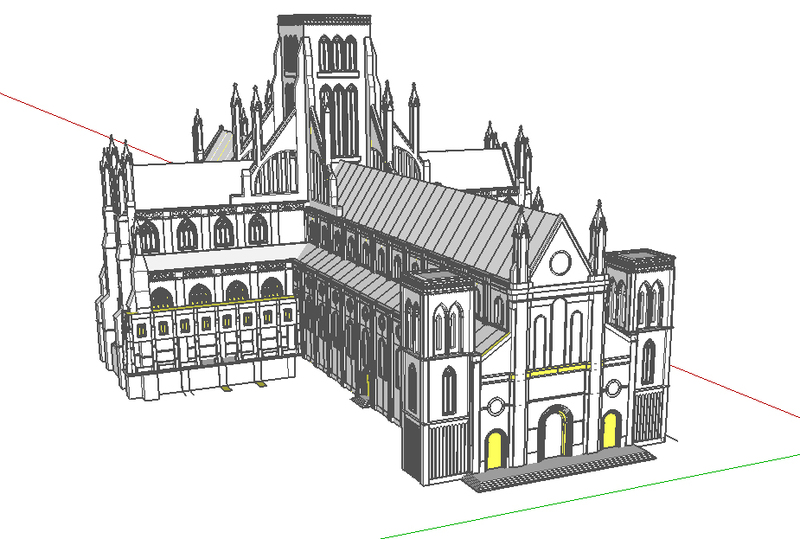 Model Analysis The two wire frame images of the Cathedral show the reversed faces of the Sketchup model. 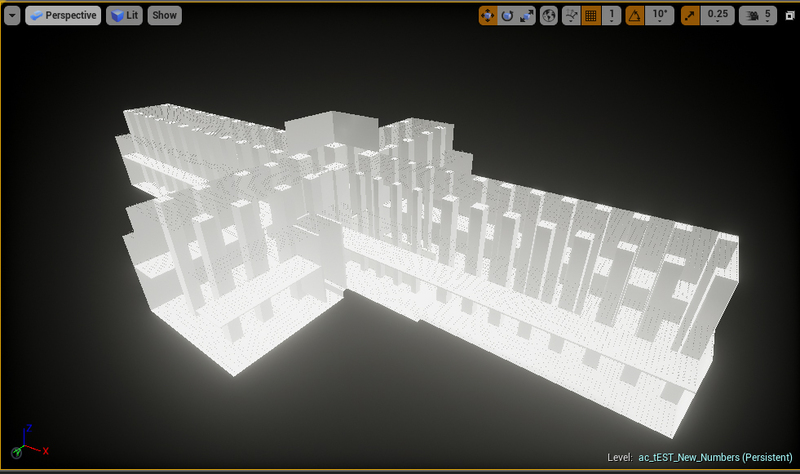 These are shown in yellow to highlight that the areas correspond to the missing faces in the Unreal Engine. This was a step taken outside of the Unreal software to determine the extent of the reversed faces in a more efficient manner than reviewing in the Unreal Engine environment. This is the first step to correcting the faces. Once the faces are identified in the manner, steps can be taken in the program to reverse them through manually selecting the surfaces that are incorrectly oriented and reversing the faces. 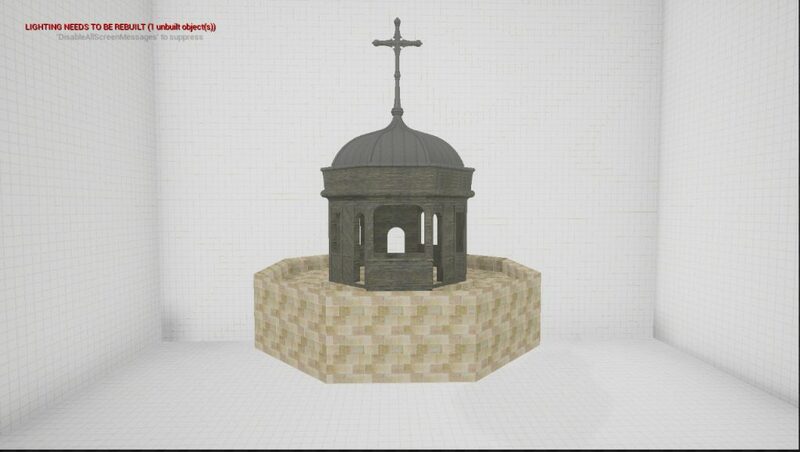 This image shows our model of the Paul’s Cross Preaching Station as a stand-alone element of the model within the Unreal Engine game environment. This environment allows for the models to be viewed independently from the full simulated environment. This method of viewing allows for user to experience the details of the models that would not otherwise be accessible in the simulation environment. The environment currently has multiple viewing methods including a fixed camera in which the model is able to be rotated along all axes and a user controlled camera that allows for full range of movement in and around the model. 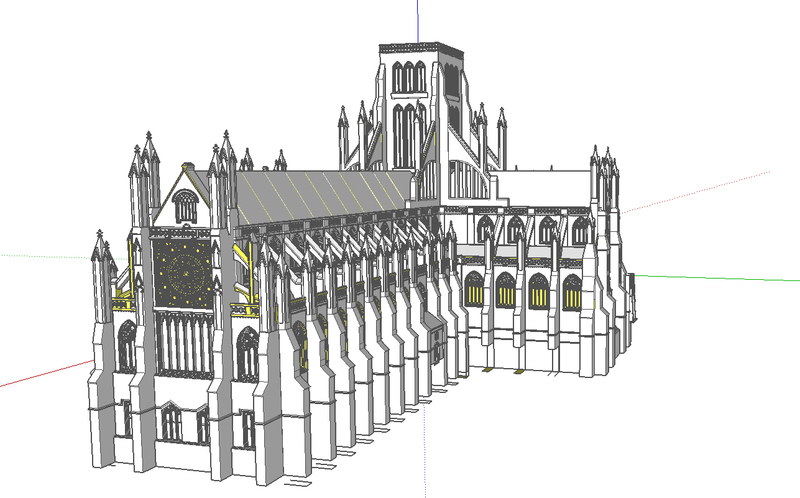 These images show the acoustic model of the Cathedral’s interior we have created for use in modeling the sound of worship services conducted inside the Cathedral. 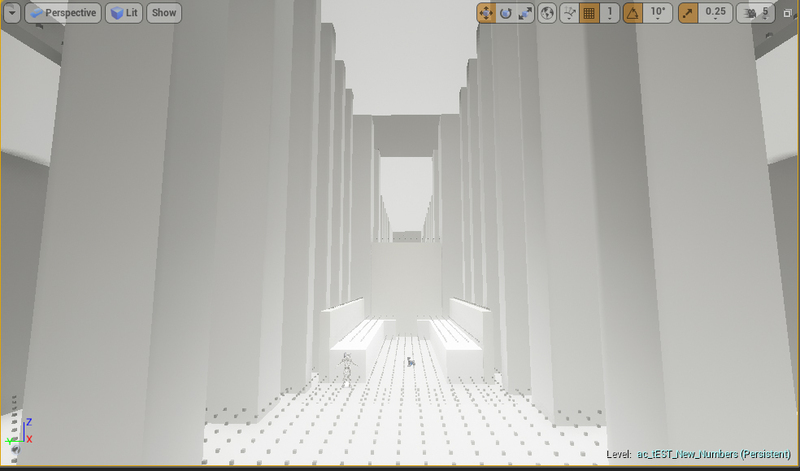 These images are taken from the Unreal Engine environment with all images with the exception of the interior view showing an overview of the model. The interior view show the choir side of the cathedral with a close up view of the acoustic grid overlaid into the model. The grid is used to generate the reverberation properties of the space. Fundamentally, the model is a very basic mesh used to test the acoustical software and will not be visible in the final production. The model was generated in modeling software and then imported in to the Unreal Engine. 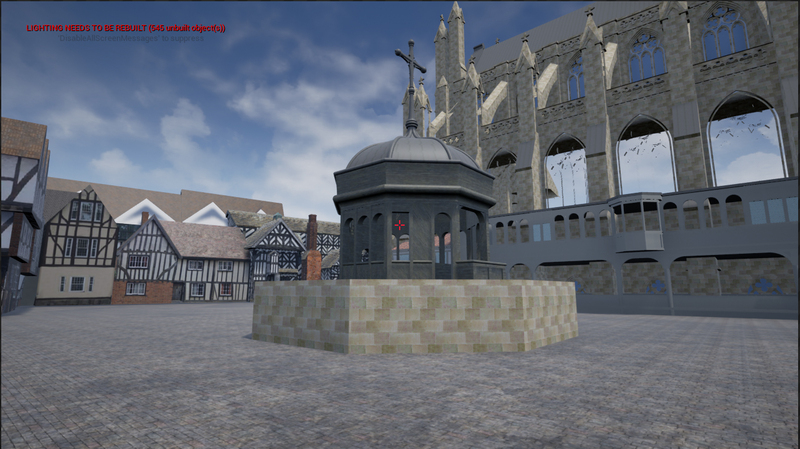 In the final build, the acoustic model with either be overlaid onto the final building meshes and rendered invisible or the acoustic properties will be applied directly to the final building meshes to generate a similar outcome.